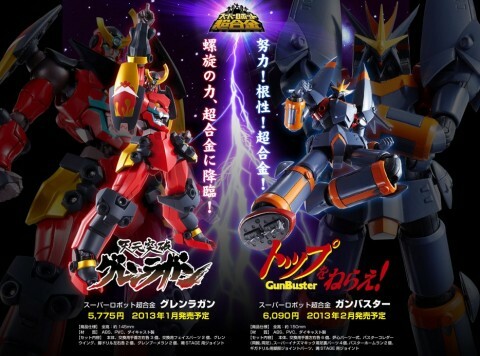 Bandai have finally shown the fruits of their recent alliance with Gainax in the form of two new Super Robot Chogokin toys; that of the mighty Gurren Lagann and the majestic Gunbuster. Both figures will be released next year, with the former in January and the latter in February. In addition, their pricing at around 6,000 yen a piece is also pretty reasonable. What we’re most confused about though is why these designs in particular. There are already a lot of Gurren Lagann figures on the market and Bandai already did an amazing Soul of Chogokin Gunbuster, not to mention the Composite Ver Ka release too. Anyway, there will be a separate option parts set and both figures will have interchangeable parts. Kick reason to the curb etc. etc.! Hey, wow, they don’t cost $300 friggn dollars. Maybe I’ll buy one.